Vogue magazine is for the avid fashion fan, with pages of catwalk snaps, seasonal insights, celebrity style and designer inspiration. Flick through the pages of the best known fashion magazine and find enough lavish style to feed your inner fashionista. Read the latest articles from top fashion editors and feast your eyes on the hottest fashion shoots of the season. 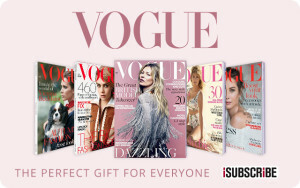 An iSubscribe gift voucher lets them order their very own Vogue magazine subscription and enjoy months of seriously distinctive style. A subscription to the magazine gives you a new issue every month- making a iSubscribe gift card the gift that keeps on giving!